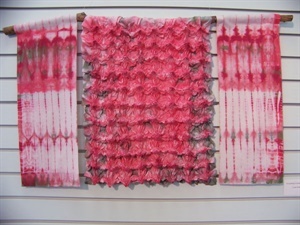 Art pieces are created using hand dyed textiles, fibers and photography. Some of the pieces are embellished using quilting, beading and embroidery techniques. 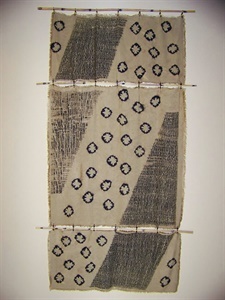 Hand dyed Karamatsu shibori on silk broadcloth (center panel). Hand dyed pleated & tied shibori silk noil side panels hanging from tree branch. Center panel is beaded. 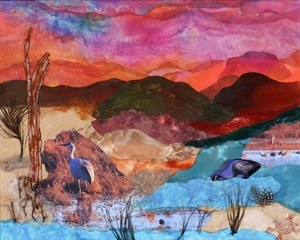 Mixed media collage includes hand dyed silks and natural fibers, feathers, and photography on canvas. 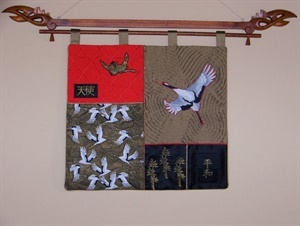 Quilted silk,cotton appliqued collage wall hanging. Hanger not included. Discharged shibori rayon triptich. Embellished with beading which connects the 3 pieces to bamboo rods.